I love old books! It’s a trait I get from my mother, who loves nothing better than browsing through the thrift store book bins, looking for treasures. Whenever she finds anything remotely related to weaving, she picks it up for me. Sometimes these finds introduce me to different techniques, like the Ann Sutton/Pat Holtom classic Tablet Weaving. 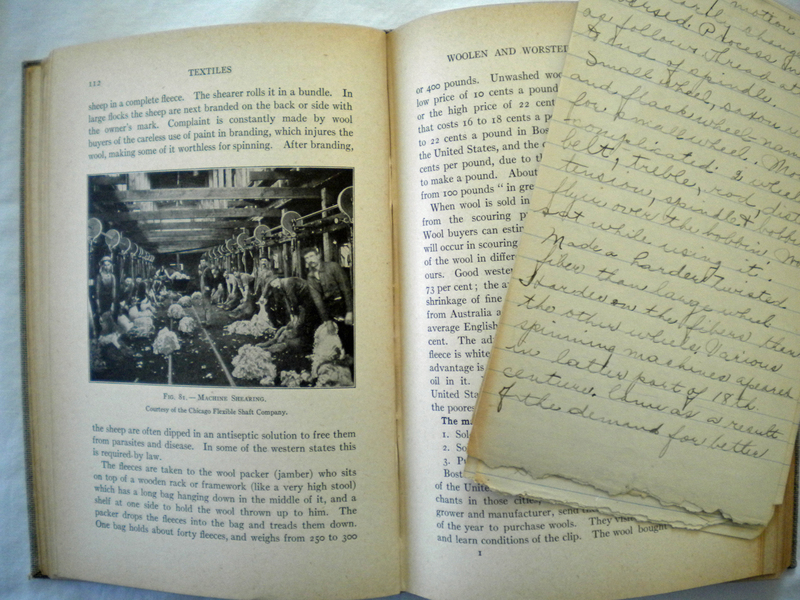 Sometimes it’s just a really old book that looks interesting, like the 1917 edition of Textiles: A Handbook for the Student and the Consumer by Wollman and McGowan complete with somebody’s handwritten class notes. She got that one for $1.00. I can get lost in these books, skimming the yellowed pages and trying to figure out the convoluted sentence structure and arcane references to equipment long out of use. But the study is worth it. There are skills these weavers used that we’ve forgotten and I want to glean everything I can from these early teachers. This past Christmas, I acquired two “new” old books. Our guild’s holiday party includes a gift exchange and I was gifted with Fabric Painting and Dyeing for the Theatre by Deborah M. Dryden (thank you, Patti! ), a 1981 study of fabric manipulation for theatre productions. Fascinating what can be done! Then on Christmas morning, my husband gave me the 1956 edition of Manual of Swedish Hand Weaving by Ulla Cyrus. This is a classic! 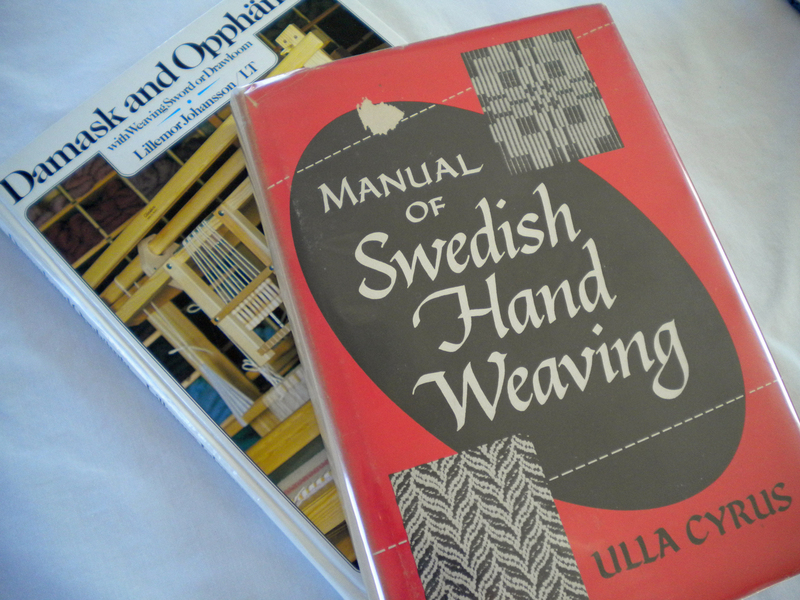 When I bought my Swedish loom in 1993, there were two books experienced weavers recommended: Damask and Opphämta by Lillemor Johansson and Manual of Swedish Hand Weaving by Ulla Cyrus-Zetterström. Johansson’s book quickly joined my library; the step-by-step instructions for damask weaving guided me through many a warp. 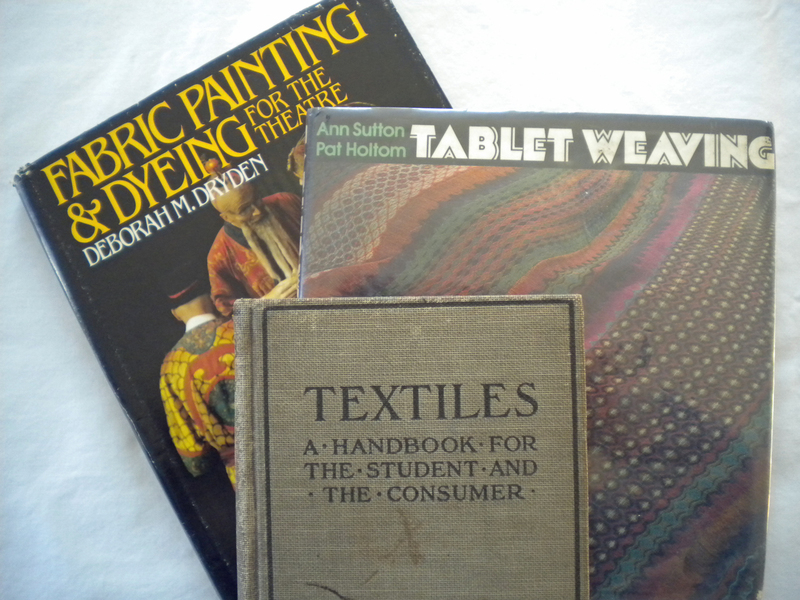 However, the Manual of Swedish Hand Weaving was out of print. So I waited. Good books are often reprinted at some point. Now my wait is over. I have a new friend! Since Christmas, I have been poring over the pages of this early edition, deciphering the details of weave structures and studying techniques I’ve practiced without understanding. (I admit to being able to follow a “recipe” without understanding the basis for it.) I hope to glean new understanding as I study this classic further.